Background: A simple and sensitive reversed-phase high-performance liquid chromatography (HPLC) method based on liquid-liquid extraction was established and validated for determination of docetaxel (DTX) in plasma of rat. Materials and Methods: Samples were spiked with paclitaxel as the internal standard and the chromatographic separation was carried out using C18 HPLC column. The mobile phase consisted of a mixture of acetonitrile/water with the ratio of 60/40 v/v. The ultraviolet detector was operated at 230 nm, and the flow rate of mobile phase was 1 ml/min. The method was validated for linearity, precision, accuracy, recovery, and limit of quantification (LOQ). Then the method was applied to quantify DTX in the rat plasma after intravenous (IV) administration of the self-assembled micelles of folate-targeted Synpronic F127/cholesterol (FA-PF127-Chol) loaded with DTX and Taxotere® as the reference marketed solution of DTX. The blood samples were taken from the ophthalmic vein at predetermined time intervals after treatment. Results: Calibration curve was linear between the concentration ranges of 0.1–7.5 μg/ml with the relative standard deviation % and evaluating error % ranged from 2.263 to 15.53 and −12.75 to 12.7 for intra- and inter-day validity, respectively. The mean recovery of the drug after plasma extraction was 95.67 ± 0.99% for the concentration of 1 μg/ml. The LOQ and the limit of detection for DTX in serum were 100 ng/ml and 30 ng/ml, respectively. Conclusions: The results indicated that the developed method could be adopted for pharmacokinetic studies of DTX-loaded FA-PF127-Chol micelles and Taxotere® in rat. Docetaxel (DTX) is a microtubule stabilizing agent interfering with mitosis and cell division. DTX has considerable activity in a broad spectrum of cancer including advanced breast cancer, nonsmall cell lung cancer, head and neck cancer, gastric cancer, bladder cancer, and melanoma. However, because of poor aqueous solubility, it is formulated using Tween 80 and is marketed as Taxotere ® that often causes hypersensitivity reaction in patients after administration., On the other hand, after dilution with a hydroalcoholic solvent, Taxotere ® formulation is unstable and should be taken as soon as possible. Thus, there is an urgent need to develop a new delivery system for systemic administration of DTX. Polymeric micelles, a multimolecular assembly of block copolymers with core-shell structure, have gained considerable attention as drug delivery systems to improve therapeutic efficacy and reduce drug toxicity. They have potential to solubilize hydrophobic drug in micelle core, increase blood circulation time, evade scavenging by the reticuloendothelial system, passive targeting of drug to tumor tissue by the enhanced permeability and retention (EPR) effect, and sustain drugs in tumor tissue., Furthermore, the innovative idea of active targeted drug delivery has motivated to surface modification of polymeric micelles by ligands, targeting tumor tissue to increase drug accumulation not only in tumor tissue but also in tumor cells. Our group recently developed a novel polymeric micelle consists of folic acid-targeted Synpronic F127-cholesterol copolymers (FA-PF127-Chol) containing DTX for targeting the drug to melanoma tissue. The separation and analysis of DTX in biological fluids and tissues have been mainly performed by high-performance liquid chromatography (HPLC) techniques using different cleanup procedures including protein precipitation using methanol, acetonitrile (ACN), the mixture of methanol/ACN, and trichloroacetic acid, solid-phase extraction,, liquid-liquid extraction, and different internal standards (IS) such as butyl 4-hydroxybenzoate, loratadine, N-heptylbenzamide, and paclitaxel (PTX).,, Protein precipitation method can deteriorate the chromatographic column due to inadequate protein precipitation and decrease the sensitivity of assay. None of these reported methods involved short retention time using a simple and economical process of liquid-liquid extraction. In the present study, we investigated the optimum conditions for the analysis of DTX and successfully established a rapid HPLC method for studying the pharmacokinetic characteristic of DTX-loaded FA-PF127-Chol following IV administration in rats and the results were compared with Taxotere ®. DTX and PTX were purchased from Cipla (India). DTX loaded in micelles of FA-PF127-Chol was prepared in our laboratory (Isfahan University of Medical Science). ACN and methanol (preparative HPLC grade) were purchased from Merck Chemical Company (Germany). HPLC study was carried out using a Waters HPLC system model 746 (USA) consisted of an HPLC pump model 515, a Waters 2487 Dual ultraviolet absorbance detector, Rheodyne 7725I autoinjector, and 746 chromatopac injectors. A C18 column (250 × 4.6 mm, 5 μm, Waters, Ireland) was used for chromatographic separation. The mobile phase was a mixture of water and ACN in a ratio of 40:60 v/v. Each run lasted 8 min. The flow rate of mobile phase was 1 ml/min and the effluent was monitored at 230 nm. Male Wistar rats were supplied by the Pasteur Institute (Iran). All rats were maintained under normal condition and allowed free access to water and food. All animal experiments were in accordance with Isfahan University Ethics Committee (Isfahan, Iran). DTX stock solution with a concentration of 200 μg/ml was made by dissolving 10 mg of the drug in 50 ml of methanol. Working solutions at the concentrations of 1, 3, 5, 10, 20, 50, 75 μg/ml were prepared by dilution of the standard stock solution with methanol. PTX stock solution at concentration of 20 μg/ml was also prepared in methanol as the IS. Specificity of analytical method was tested by optical evaluation of chromatogram extracted from blank plasma for the presence of interference from endogenous peak at retention time of DTX and the IS. 20 μl of DTX solutions at concentrations of 1, 3, 5, 10, 25, 50, 75 μg/ml and 20 μl of IS at concentration of 20 μg/ml were added to 200 μl of blank plasma to obtain PTX concentration at 2 μg/ml and DTX concentrations ranging from 0.10 to 7.5 μg/ml. After 30 s mixing, 4 ml of the ether was added to each test tube and vortexed for 3 min. After that, the samples were centrifuged at 5000 rpm for 15 min. The total organic phase was then separated, transferred to a clean test tube, and dried under the nitrogen gas. The drug residue was next reconstituted in 100 μl of mobile phase, and 70 μl of the final solution was injected into the HPLC system. Calibration curve was obtained by plotting peak area ratios of DTX/IS versus different DTX plasma concentrations. The recoveries of DTX were determined by comparing the peak areas achieved after extraction of known amount of DTX from plasma with those obtained from the same amounts of DTX in mobile phase. The precision and accuracy of the assay were determined by repeating analysis of samples of DTX at concentrations within the range of calibration curve in 3 days and 3 times in a day. The precision of an HPLC method was determined by evaluating intra- and inter-day relative standard deviations percent value (RSD%). The accuracy of the HPLC method was demonstrated by evaluating error percent value. Limit of detection (LOD) is defined as the lowest detectable concentration of analyte of signal to noise ratio was ≥3. Limit of quantification (LOQ) was identified as the lowest plasma concentration of the standard curve with an acceptable accuracy within ±20% and the precision below 20%. Where C(t) is the drug concentration at time t, A and B are intercept of ordinate axis, and α and β are the corresponding first-order disposition rate constants. [Figure 1] shows the typical chromatogram of blank plasma, spiked with PTX (internal standard) and DTX at concentrations of 0.1, 1, and 7.5 μg/ml, plasma sample obtained 2 min after IV administration of DTX (7 mg/kg) and plasma sample obtained 2 h after IV administration of DTX (7 mg/kg). The retention times of DTX and PTX were 5.9 and 6.5 min, respectively. The overall run time lasted 8 min. This retention time was less than similar studies for HPLC analysis of DTX in plasma in which the retention time of DTX was reported to be 7.7, 8.5, and 9.2 min.,, No interfering peaks were observed in chromatogram at retention times of DTX and PTX in specified conditions. The peak area ratio of DTX to PTX was plotted against DTX concentration in plasma. The good linearity was found in the range of 0.1–7.5 μg/ml. The typical linear regression equation in rat plasma obtained was Y = 0.487X−0.0058 with a correlation coefficient of 0.9997. The results of between days and within day variability are given in [Table 1]. The absolute value of percent of RSD and relative error% are <15.53 and 12.75, respectively, which are below the limits specified for precision and accuracy (i.e., <20%). These results indicate the method is reproducible between and within day. The LOD and LOQ were determined to be 30 and 100 ng/ml, respectively. The mean recovery with diethyl ether was about 94.26 ± 6.44%, 95.67 ± 0.99%, and 94.29 ± 3.22% at 0.5 μg/ml, 1 μg/ml, and 2 μg/ml for DTX, respectively. This indicates the recovery of DTX using the mentioned method was efficient and consistent. The applicability of the method described here was evaluated by analysis the samples taken after administration of Taxotere ® and DTX-loaded FA-PF127-Chol nanomicelles. Taxotere ® and DTX-loaded FA-PF127-Chol were administered intravenously through tail vein at a dose of 7 mg/kg and samples were taken at the predetermined time. The plasma concentration of drug versus time is illustrated in [Figure 2]. In present study, the HPLC method developed is sensitive, specific and reproducible for the quantitative determination of DTX in human plasma requiring short retention time and small volumes of plasma for analysis. This simple analytical method based on liquid-liquid extraction and a total run time of 8 min permits the large number of samples in a short period of time. The HPLC assay developed in the present study was successfully used for studying the pharmacokinetic characteristic of DTX-loaded FA-PF127-Chol following IV administration in rats. A two-compartment model was used to evaluate the pharmacokinetic of the two formulations, and pharmacokinetic parameters were listed in [Table 2]. Plasma concentrations of DTX obtained at 0.033 h after IV injection of DTX-loaded FA-PF127-Chol was approximately twofold higher than that of Taxotere ® (7233.705 ± 1730.34 vs. 3813.27 ± 870.25 ng/ml). The possible reason could be related to slow release behavior of micelles which could not distribute readily. As a result, they made higher concentration at the first sampling time. The plasma AUC0−∞ of DTX-loaded FA-PF127-Chol micelles (2994.44 ± 418.3 ng/h/ml) increased significantly compared to that of Taxotere ® (1227.58 ± 33.20 ng/h/ml). This was resulted from a significant decrease of Vdss and the CL values for DTX-loaded micelles compared to Taxotere ®. Moreover, MRT and T1/2β for FA-PF127-Chol micelles were significantly longer than those of Taxotere ® (P < 0.05). These results indicated FA-PF127-Chol could increase somewhat blood circulation time and decrease DTX elimination time. In brief, simple, sensitive, and selective HPLC method based on liquid-liquid extraction method was developed for analyses of DTX in plasma samples. All the validation data, such as accuracy and precision, were within the required limits. Developed HPLC method is easy, fast to perform, and economic. This analytical procedure can readily be used for pharmacokinetic studies of DTX in rats. The authors acknowledge the financial support of Iran National Science Foundation and Isfahan University of Medical Sciences. Liu Z, Liu D, Wang L, Zhang J, Zhang N. Docetaxel-loaded pluronic p123 polymeric micelles: In vitro and in vivo evaluation. Int J Mol Sci 2011;12:1684-96. Wang X, Wang Y, Chen X, Wang J, Zhang X, Zhang Q. NGR-modified micelles enhance their interaction with CD13-overexpressing tumor and endothelial cells. J Control Release 2009;139:56-62. Hu K, Cao S, Hu F, Feng J. Enhanced oral bioavailability of docetaxel by lecithin nanoparticles: Preparation, in vitro, and in vivo evaluation. Int J Nanomedicine 2012;7:3537-45. Jhaveri AM, Torchilin VP. Multifunctional polymeric micelles for delivery of drugs and siRNA. Front Pharmacol 2014;5:77. Wang C, Mallela J, Mohapatra S. Pharmacokinetics of polymeric micelles for cancer treatment. Curr Drug Metab 2013;14:900-9. Kedar U, Phutane P, Shidhaye S, Kadam V. Advances in polymeric micelles for drug delivery and tumor targeting. Nanomedicine 2010;6:714-29. Varshosaz J, Taymouri S, Hassanzadeh F, Javanmard SH, Rostami M. Folated synperonic-cholesteryl hemisuccinate polymeric micelles for the targeted delivery of docetaxel in melanoma. Biomed Res Int 2015;2015:746093. Cho HJ, Park JW, Yoon IS, Kim DD. Surface-modified solid lipid nanoparticles for oral delivery of docetaxel: Enhanced intestinal absorption and lymphatic uptake. Int J Nanomedicine 2014;9:495-504. Lee SW, Yun MH, Jeong SW, In CH, Kim JY, Seo MH, et al. Development of docetaxel-loaded intravenous formulation, Nanoxel-PM™ using polymer-based delivery system. J Control Release 2011;155:262-71. Hou W, Watters JW, McLeod HL. Simple and rapid docetaxel assay in plasma by protein precipitation and high-performance liquid chromatography-tandem mass spectrometry. J Chromatogr B Analyt Technol Biomed Life Sci 2004;804:263-7. Le Garrec D, Gori S, Luo L, Lessard D, Smith DC, Yessine MA, et al. Poly(N-vinylpyrrolidone)-block-poly(D, L-lactide) as a new polymeric solubilizer for hydrophobic anticancer drugs: In vitro and in vivo evaluation. J Control Release 2004;99:83-101. Rosing H, Lustig V, Koopman FP, ten Bokkel Huinink WW, Beijnen JH. Bio-analysis of docetaxel and hydroxylated metabolites in human plasma by high-performance liquid chromatography and automated solid-phase extraction. J Chromatogr B Biomed Sci Appl 1997;696:89-98. Garg MB, Ackland SP. 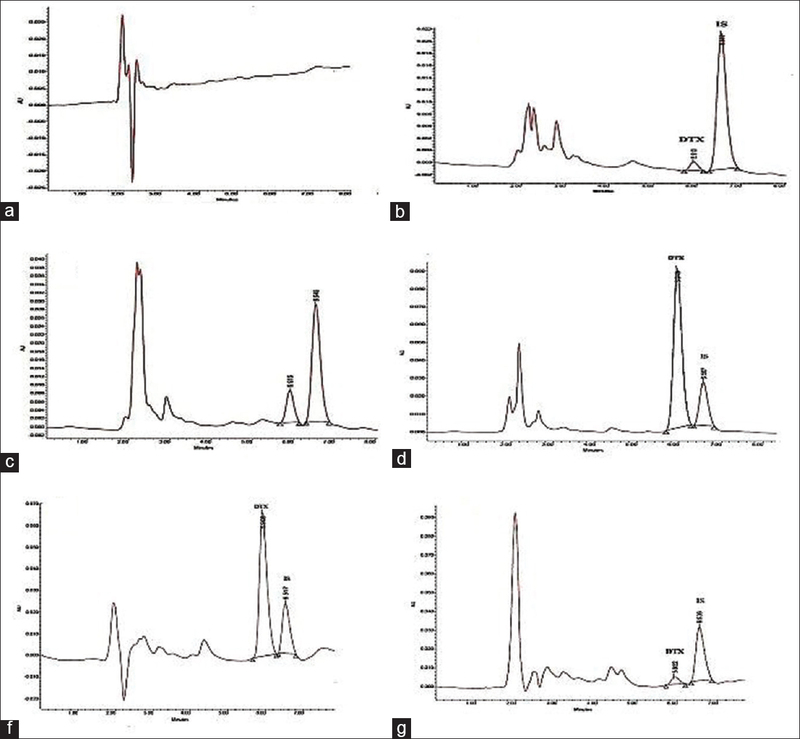 Simple and sensitive high-performance liquid chromatography method for the determination of docetaxel in human plasma or urine. J Chromatogr B Biomed Sci Appl 2000;748:383-8. Ciccolini J, Catalin J, Blachon MF, Durand A. Rapid high-performance liquid chromatographic determination of docetaxel (Taxotere) in plasma using liquid-liquid extraction. J Chromatogr B Biomed Sci Appl 2001;759:299-306. Loos WJ, Verweij J, Nooter K, Stoter G, Sparreboom A. Sensitive determination of docetaxel in human plasma by liquid-liquid extraction and reversed-phase high-performance liquid chromatography. J Chromatogr B Biomed Sci Appl 1997;693:437-41. Zufía López L, Aldaz Pastor A, Aramendia Beitia JM, Arrobas Velilla J, Giraldez Deiró J. Determination of docetaxel and Paclitaxel in human plasma by high-performance liquid chromatography: Validation and application to clinical pharmacokinetic studies. Ther Drug Monit 2006;28:199-205. Emami J, Fallah R, Ajami A. A rapid and sensitive HPLC method for the analysis of celecoxib in human plasma: Application to pharmacokinetic studies. DARU 2008;16:211-7. Talari R, Varshosaz J, Mostafavi A, Nokhodchi A. Development and validation of anovel RP-HPLC method for pharmacokinetic studies of gliclazide in rat. Farmacia 2011;59:388-95. Kim SY, Lee YM, Shin HJ, Kang JS. Indomethacin-loaded methoxy poly (ethylene glycol)/poly(epsilon-caprolactone) diblock copolymeric nanosphere: Pharmacokinetic characteristics of indomethacin in the normal Sprague-Dawley rats. Biomaterials 2001;22:2049-56. Zhao M, Su M, Lin X, Luo Y, He H, Cai C, et al. Evaluation of docetaxel-loaded intravenous lipid emulsion: Pharmacokinetics, tissue distribution, antitumor activity, safety and toxicity. Pharm Res 2010;27:1687-702.